1) How to interprete the error message? 2) How to create a vertical and indented child list? Since I'm a beginner I want to check if I'm using it right before submitting an issue. I'm using build 117.9406 (MPS 2.5 downloaded from the website). We encourage everyone to use indent layout instead of vertical/horizontal one where applicable. To create an indented vertical collection you can create wrapping indent collection (looks like [- -]) with indent-layout-indent: true, selectable : false. (selectable = false means the selection won't stop on this collection while you press Ctrl-Up). 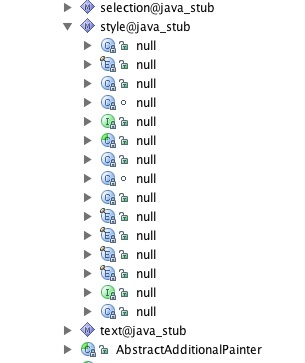 Then, on child collection use indent-layout-new-line-children : true. Whenever you see (right-click to see exception) it is most probably our fault. At least we didn't provide a better error message from the generator. There are many ways to fix it on your side. 1. Run "Check model" context-menu action on your model. If there are any errors, fix them. Usually this helps. 2. Turn on "Save transient models option" (T icon in the bottom-right corner), browse them in the logical view to review the generation steps. You may compare two transient (aka intermediate) models by selecting them in the tree and choosing "Compare" menu action. Is there probably something inconsistent / wrong with the packaged models in my installation? Or was something not correctly generated? 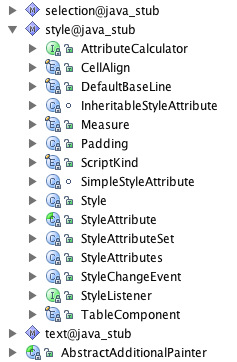 Do I need to specify a "name" for the styles in my editor? It seems like you experience problems with MPS loading..